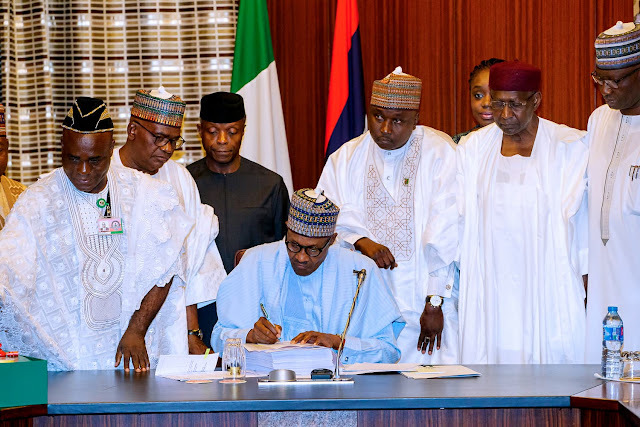 President Muhammadu Buhari told a shocked nation today how the National Assembly mutilated and rewrote the budget proposals for 2018 as proposed by the Executive last November. 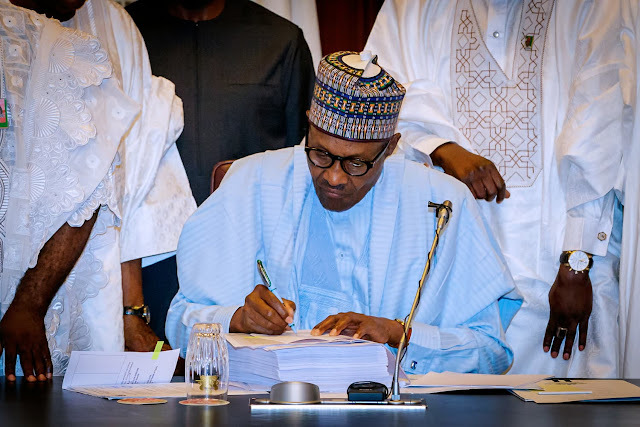 In a brazen usurpation of executive powers, the National Assembly slashed 347 billion Naira in the allocations to 4,700 projects submitted to it for consideration and introduced 6,403 projects of its own amounting to 578 billion Naira, President Buhari said. 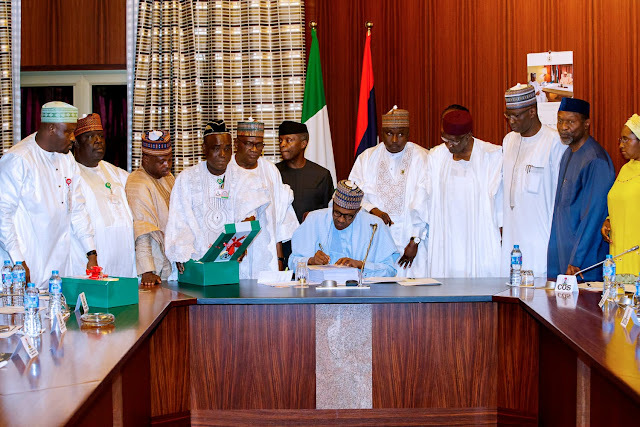 He spoke at the signing of the budget in Abuja, seven months after it was presented to the National Assembly. President Buhari said the various projects for which the National Assembly denied funds are critical and may be difficult, if not impossible, to implement with the reduced allocation. Among them are the Mambilla Power Plant, Second Niger Bridge/ancillary roads, the East-West Road, Bonny-Bodo Road, Lagos-Ibadan Expressway and Itakpe-Ajaokuta Rail Project. President Buhari said the National Assembly slashed funding to them by an aggregate of 11.5 billion Naira. ” Similarly, provisions for some ongoing critical infrastructure projects in the FCT, Abuja especially major arterial roads and the mass transit rail project, were cut by a total of 7.5 billion Naira. “The provision for Rehabilitation and Additional Security Measures for the United Nations Building by the FCT, Abuja was cut by 3.9 billion Naira from 4 billion Naira to 100 million Naira. He said the cutting will make it impossible for the Federal Government of Nigeria to fulfill its commitment to the United Nations on this project. Also affected are the provisions for various Strategic Interventions in the health sector such as the upgrade of some tertiary health institutions, transport and storage of vaccines through the cold chain supply system, provision of anti-retroviral drugs for persons on treatment, establishment of chemotherapy centres and procurement of dialysis consumables were cut by an aggregate amount of 7.45 billion Naira. Another is the planned security infrastructure for the 104 Unity Schools across the country. The National Assembly cut the budget by 3 billion Naira at a time when securing our students against acts of terrorism ought to be a major concern of government. The National Assembly reduced the provision for the Federal Government’s National Housing Programme by 8.7 billion Naira. It also slashed the funding for Pension Redemption Fund and Public Service Wage Adjustment by N5billion, at a time when the government is working with Labour to address compensation-related issues. Also cut by N14.5billion were the provision for Export Expansion Grant (EEG) and Special Economic Zones/Industrial Parks, which are key industrialisation initiatives of this Administration. The National Assembly reduced the funding for the completion of the Terminal Building at Enugu Airport from 2 billion Naira to 500 million Naira, an action the President noted, would further delay the completion of this critical project. Slashed also was the take-off grant for the Maritime University in Delta State, a key strategic initiative of the Federal Government. It was cut from 5 billion Naira to 3.4 billion Naira. The president noted that Some of the new projects inserted by the National Assembly have not been properly conceptualized, designed and costed and will, therefore, be difficult to execute”. 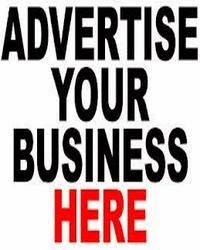 ” About seventy (70) new road projects have been inserted into the budget of the Federal Ministry of Power, Works, and Housing. In doing so, the National Assembly applied some of the additional funds expected from the upward review of the oil price benchmark to the Ministry’s vote. Regrettably, however, in order to make provision for some of the new roads, the amounts allocated to some strategic major roads have been cut by the National Assembly. ” As it is, some of these projects relate to matters that are the responsibility of the States and Local Governments, and for which the Federal Government should therefore not be unduly burdened. “Another area of concern is the increase by the National Assembly of the provisions for Statutory Transfers by an aggregate of 73.96 billion Naira. Most of these increases are for recurrent expenditure at a time we are trying to keep down the cost of governance. “An example of this increase is the budget of the National Assembly itself which has increased by 14.5 billion Naira, from 125 billion Naira to 139.5 billion Naira without any discussion with the Executive”.